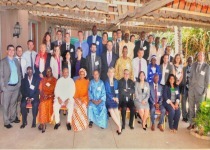 This training seminar on effective countering violent extremism (CVE) programming in West Africa and the Sahel, held under the auspices of the European Commission, was facilitated by CIVIPOL and organized and instructed by a team of multidisciplinary regional and international experts. The three-day training convened a diverse group of EU delegates and member states and government and civil society representatives from across West Africa and the Sahel to discuss the broader challenges posed by violent extremism in the region and to conceptualize and operationalize CVE interventions within this context. The convergence of complex development, political, and security challenges in the region has created conditions conducive to the emergence of violent extremist groups. Porous borders, ungoverned spaces, limited government authority, resources and capacities, and historical sociopolitical divisions have also created opportunities for violent extremism to take root. A burgeoning youth bulge, unemployment, roaming armed combatants, and the possibility of election-related violence were cited as regional concerns. The training curriculum was designed to strengthen participants’ understanding of the drivers of violent extremism more broadly, and then consider its particular dynamics in the subregion, and provide actionable tools and good practices for addressing CVE objectives in the context of multidimensional development, justice, and security initiatives. The training focused on identifying and engaging local partners whose work contributes to strengthening resilience against violent extremism, considering what narratives and counter-narratives resonate with local and regional actors, and developing projects that contribute to addressing violent extremism in accordance with local context. Illustrative practical examples of concrete CVE activities being undertaken in the region highlighted some of the practical challenges and benefits of undertaking such programming. This training was the second in a series of regional trainings – the first was held in Nairobi, Kenya and covered the East Africa region and subsequent trainings will cover the regions of South Asia and North Africa.